Well.... Here we are. It is Friday, and we have now been totally free range for two whole weeks, and I must say, we are getting used to it! We had a treat ball this morning (which was wonderful), and one of the 2-foots has not gone to work today, which SHOULD mean that we get some decent attention. Flopsy Girl is starting to have tooth problems again, so hopefully the 2-foots will spot that soon (at least if they can bear to take their eyes off the light up box for long enough they will! 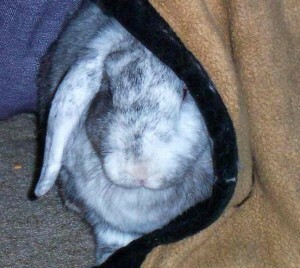 ), as Flops will need to go see Auntie Francis (the best bunny vet in the world), to get them sorted out.